Nice robe, love the feel of it. It arrived as promised and in great condition. Very pleased with the purchase . Perfect for cozy evenings at home, this cushy robe is made from ultra-plush fleece, a machine-washable microfiber that won't pill easily. This stylish robe makes an excellent gift for your loved one. This cozy robe comes equipped with a matching belt that ties at the waist, so you can easily secure this accessory. Long sleeves keep you warm once you step out of the bathtub for enhanced relaxation and convenience. This robe is even cozier than it looks in the photo! It's super fluffy and soft. I ordered the cream in an L/XL. I am 6'2" and typically wear an 8 in tops and a 12 in bottoms. The robe hits right at my knees, and the sleeves are slightly short, but that's just what comes with being tall. The top fits perfectly but the bottoms tends to open up pretty easily, though it does wrap all the way around. I washed it and it still had a few fuzzies flying around, which I'm hoping will get better after the next wash. Totally worth it for a warm comfy winter robe (especially on sale!). I might note that I'm the type of person who tends to get cold and I actually got hot in this robe one day (with nothing underneath), so it will keep you warm! It's the perfect thing to slip on on a cold winter morning. 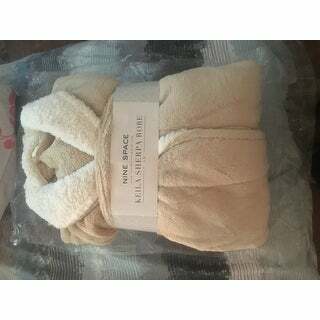 Ordered this for a gift, and the recipient is very happy and cozy with this robe. She is short (5'4") and it is a good length for her. This robe is so soft! Very thick & cozy. Nice and warm for those cold winter nights. It is not fully lined with the Sherpa. Only the edge of the robe has the Sherpa (collar, sleeve, edging). I would definitely recommend this product. I purchased the robe in soft pink - very feminine. It was just what I was looking for! I absolutely love this robe! I shopped around and found this one, it's as soft as it looks, warm, love the pockets and fits perfectly! I'm actually thinking about purchasing another one as a gift! It washes very nicely and doesn't shed. Very pleased with this purchase! Love this Sherpa robe very soft and warm too bad I ruined it when I washed it with dark jeans it turn the white a grayish off color. Great robe! This is a great robe in a very pretty color. Would highly recommend to a friend. I bought this mainly to wear as a house coat for warmth. The sleeves are a really nice length - not so long that I have trouble typing. The grey is a really pretty color. This robe is super soft and warm. Not too long but fits well and I'm 5'9". Washes up beautifully. I love this robe. It is very soft, cozy and comfortable. It does have an inside tie along with the belt. I usually wear a medium (10-12) but ordered a large which fits just fine. The collar and sleeves are very nice. I would give as a gift and/or recommend to anyone. Very nice and warm. It was a bit snug around the hips, but it’s still very comfortable. I ordered the L/XL and I’m a size 14. Soft and warm. Well made. Durable. I love this robe! Ist so comforting and soft! It's light and fluffy! Yes I would recommend this to a friend. It's like getting a cozy hug. This is a luxury that should be a necessity for e eryone.! Thick and fluffy, but even though I ordered the large (I'm usually a medium), it doesn't fully close at the bottom. Superbly soft as perfect for keeping fit keeping warm right out of the shower! I ordered this robe with a shawl collar as pictured, received one with a hood, which I did not want. Had to return and it appears they still charged me shipping for their mistake. First and last order with Overstock. "How does the sizing fit?" It's a slender fitting robe. Long sleeves, broad in the shoulders and slimmer around the waist. I got an xl and I am a size 16 women's. I'm 5'9" and 190lbs and it gapes open when fully tied around my waist when I move. Great robe other than that. Warm and soft. Had already purchased one for Christmas. Wanted to purchase 2nd one like it. Super soft and the price is right. "Is the inside of the robe lined with sherpa material?"